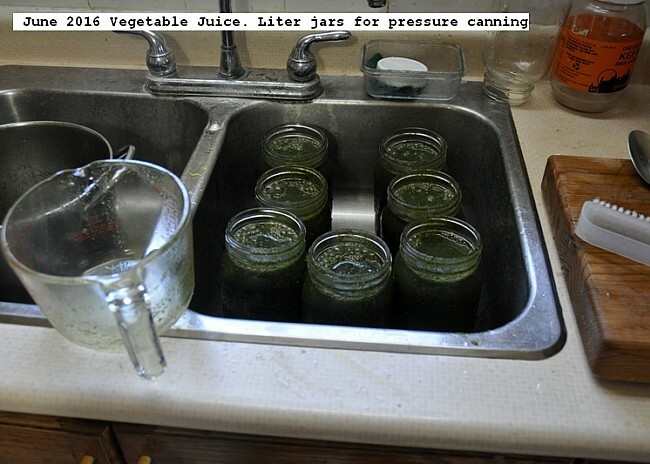 Garden vegetables which were mature were processed into seven liters of juice. Process is harvest, weigh, wash, cut into small pieces, cover with water, cook until soft about 20 minutes, blend into a slurry, stain through a food mill 2mm mesh screen, put residue from food mill through a Champion Juicer to extract maximum nutrients. Place product in liter jars and pressure can at 15 PSI for 15 minutes for long term storage at room temperature. The products used were two romaine lettuce 2 pounds, kale one pound, celery one pound, and one half pound of basil. This entry was posted in Uncategorized and tagged 12 June 2016 Vegetable Juice, Vegetable Juice. Bookmark the permalink.